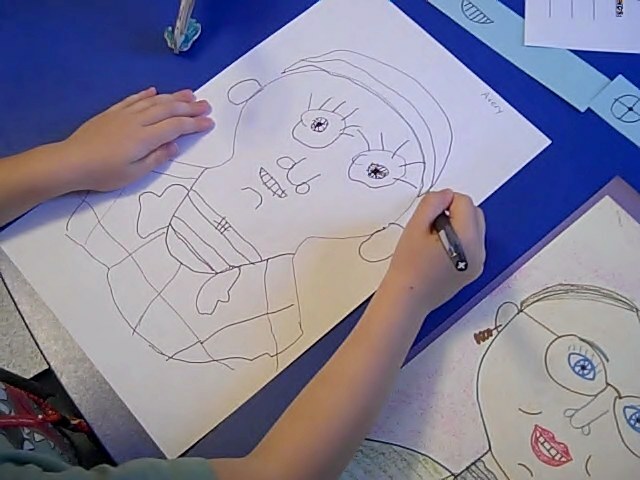 Inspired Montessori and Arts at Dundee Montessori: Copying Makes Artists? YES! I am a certified art teacher and did years of masters work in art as well as being a studio artist who has sold my work at galleries. At my Montessori school I teach children to draw. Teach it. Part of that teaching is to have children copy my childlike drawings. Yes, copy. We view and copy the shapes that make an image and once they are voiced in how to construct an image they go nuts for drawing on their own having the tools to really look and create. The process is similar to teaching phonics before they can decode any word. Here are some examples of copying to become an artist. None of these children have been in kindergarten yet. My drawing lessons are often given at a dry erase board as children copy me step by step until the image is created. This is highly effective since we talk about placement, shapes and composition as we go. A drawing table set up. Once they have confidence to draw they beg to copy from books or draw any image they see. Drawing table outcome. Not in kindergarten yet! Another good example of how children become artists by copying. "I didn't know I could do that. It is so cool and I did it!" I do similar activities with my children. These are wonderful examples - thank you for sharing! Thank you, Deb! I am honored to help our Queen out. Love this post! I especially love the idea of copying lines and formations. My daughter is only 3, but she is a wonderful artist (better than me! Ha!) and I think a lot has to do with the fact that I have encouraged her a lot in this area, much like you have done. Your students look very happy and creative! Good job!